The very foundation of Lucas’s cinematic philosophy is newness – this comes through in his obsession with technological possibilities, and through his genuinely childlike pursuit of spectacle and wonder. His work is both pre- and post-cynical, operating within literary forms that predate cinema by several centuries while also looking toward a new kind of film whose form hasn’t even been realized yet. 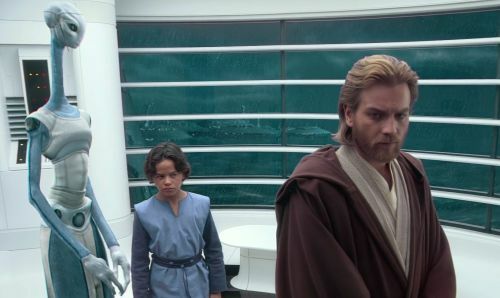 If asked to compare Star Wars Episode II: Attack of the Clones with any other film released in 2002, one might be inclined to cite Chris Columbus’s Harry Potter and the Chamber of Secrets or Peter Jackson’s The Lord of the Rings: The Two Towers. Both comparisons seem to make sense: all three titles are the second installments of mega-budget genre franchises, and all three titles saw enormous box office success. I would argue, though, that Attack of the Clones has next to nothing in common with these other works (perfectly fine genre blockbusters though they might be). 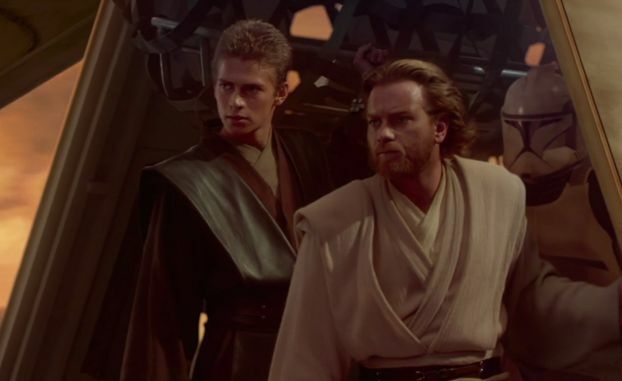 Contrary to the studio-incubated Potter and Rings franchises, Attack of the Clones – and the entirety of the six-part Star Wars saga – shows an auteur working on the largest possible scale of independent filmmaking. Financially liberated, largely due to his insistent control over merchandising rights, Lucas developed enough leverage by 1997 to fund his new trilogy and personally oversee all of the creative details. No other auteurist project has ever reached this size or seen these kinds of possibilities. And Clones is every bit the work of an obsessive auteur; not only does it reinterpret and reconfigure the expectations of its established series, but it also brings a set of radical ideas to the cinematic medium at large. Those ideas are worked out in technical terms, yes, but also in Lucas’s complicated rearrangement of genres (not only cinematic, but tracing as far back as 16th-century epic poems). This genre play doesn’t work simply as appropriation or structure-stealing; instead, genre moves through Attack of the Clones as an amorphous system, revealing surprising commonalities in superficially disparate reference points. By employing forms the audience is familiar with (whether consciously or unconsciously), Lucas unashamedly borrows techniques from propaganda – through emotional or psychological association, he is able to invoke affective responses without ever exposing his sleight of hand. The propagandistic nature of Star Wars is inherent in many of its artistic aims: Lucas states that the series takes on the language of narrative visual art, communicating to its audiences a code of social values. The moral structuring is imbedded on both subliminal and explicit levels: in character naming, in costume design, in the attribution of colour to ethical stances. There is also a nearly overwhelming affective propulsion in the synchronizing of John Williams’s score and Ben Burtt’s intricate sound design with Lucas’s forceful images. 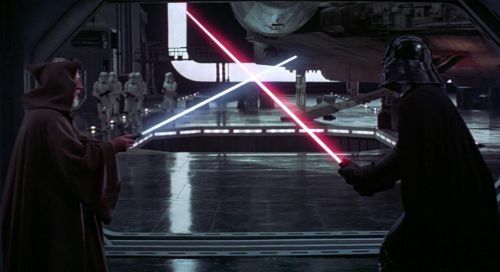 The climactic lightsaber battle, which sees a digital Yoda careening with impossible speed around villainous Count Dooku (Christopher Lee), also posits abrupt shifts in music cues and silence. 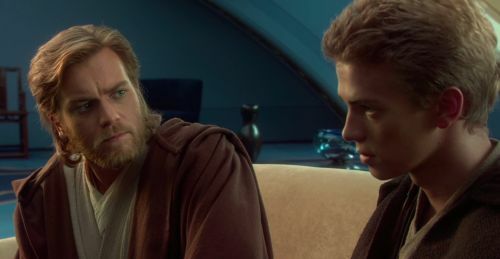 One of the scene’s stillest and most resonant images reads like Soviet montage rendered digital abstraction: through editing, Lucas mirrors close-ups of Anakin (Hayden Christensen) and Dooku, the red-blue strobe of their sabers glancing off both actors’ faces to emphasize a symmetry in moral trajectories. 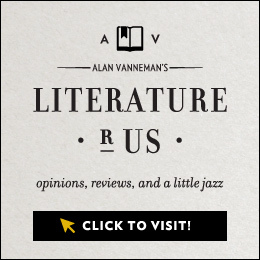 This excerpt, brief but potent, drops Williams’s score to a dull percussion, barely audible, nearly drowned out by the strained breath and sparking wires that signal combat. “Propaganda” is an ethically laden term, to be sure, but Attack of the Clones (here and elsewhere) builds its audiovisual cues toward an instinctive and often unconscious viewer reaction – good and evil are encoded, and sometimes in profoundly complicated ways. Breaking into the referential network of Star Wars is no easy task. For one, it requires a wealth of knowledge in the areas of world history, philosophy, religion, opera, cinema, literature, digital art, and of course mythology. All of these connections are crucial, but I will keep my observations contained for the sake of brevity and focus. Here, I will focus mostly on the cinematic lineage that shows through in Clones, with brief literary asides for necessary context. To begin, I look to Lucas’s most sustained career-long traits – first and foremost, he is and has always been an experimental filmmaker. To that end, if pressed to put Clones into conversation with any other 2002 release, I would push aside Potter and Rings and posit instead Michael Snow’s *Corpus Callosum. The comparison might at first invite dismissal, but there’s an intuitive and stable link between the two films. To be sure, Snow is a critically celebrated avant-garde auteur in his own creative environment, who has made major contributions to various media: his structuralist short film Wavelength (1967) was included in the British Film Institute’s 2012 list of top 250 films; and his expansive, sublimely unnerving La Région Centrale (1971) still celebrates status as a classic of experimental cinema. While I don’t intend to outline similarities in the career trajectories or artistic intentions of Lucas and Snow, I’ve made this comparison to highlight Clones’ underpinning philosophy of experimentalism. And in order to break into a discussion of the film’s complicated relationship to avant-garde cinema (and of its advanced interplay with many genres), it’s productive first to put it into conversation with one of its contemporaries. Some might argue that Attack of the Clones and *Corpus Callosum are fundamentally opposed in terms of their relationships to filmic “illusions of reality” or “representationalism,” and likewise in terms of their relationships to plot or narrative conceits. Michael Snow’s 2002 film has no interest in maintaining such an “illusion of reality.” To the contrary, it foregrounds its own artificiality, not only to destabilize customary viewing practices, but also to build its own sense of a strangely particular world. In Callosum, Snow depicts blatantly staged scenes (usually more tableaux than action) into which absurd interventions break through: digital animation imposes a giant phallus into an office space, bodies meld together into moving and multicolored blocks, wall décor disappears, and characters’ genders repeatedly switch without warning. For Snow, these frequently vaudevillian approaches to digital technology also pose new possibilities within the frame: how can such bold digital erasures/additions alter what and how the viewer is seeing? Can the frame be approached from a cubist perspective, rather than as a flat surface for the transmission of linear narrative action? To be sure, many of these philosophies are specific to *Corpus Callosum. However, it does share similarities with Clones in that both films lend a primary focus to the capacities for change in the moving image. Also, Clones can be likened to Callosum in that both works call attention to their means of production – Callosum depicts its own animators at work, and at one point cheekily scrawls its creator’s credits across the screen. Clones plunges live actors Hayden Christensen and Natalie Portman through the purely digital construction of a droid factory, which simulates the film’s own production of characters and worlds. 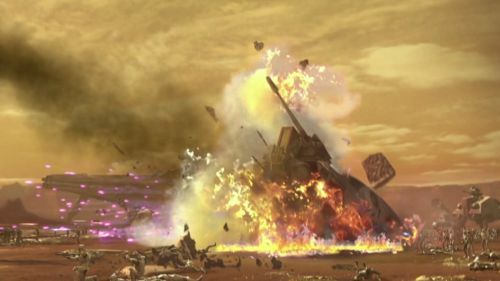 This scene is punctuated by fast and rhythmic editing, scored by the tempos of industrial sound design, and at one point pits an animated Geonosian guard against Padmé (Natalie Portman) in physical combat. These sensory gestures work to enforce the scene’s “reality” (the tactility of the Geonosian, the weight and sound of the factory machines), which positions it in direct contrast to Snow’s work. However, Clones is by no means an attempt at “realism”; the film reminds us always that it is an artistic expression or extension of our world, not an emulation of it. Lucas emphasizes the film’s cinematic qualities repeatedly, not least in the broadly soap-operatic tones of its central romance – Anakin and Padmé frolic through the green fields of Naboo, accompanied by John Williams’s swooping, Max Steiner-esque score, and the characters often articulate their affection in unforgivingly theatrical strokes. 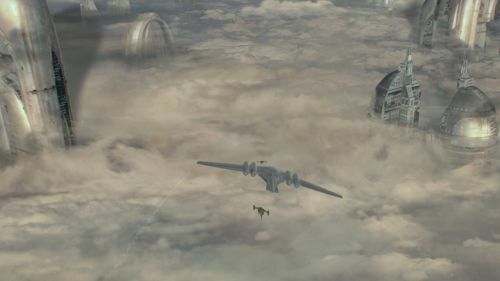 Lucas wants to subsume us in the details of his worlds, no doubt, and there’s no shortage of painterly attention in the establishing shots of planets (especially the noir-like rainscapes of Kamino, the vistas of nighttime Coruscant, and the reddish termite structures of Geonosis). However, the director’s attention to external references and highly stylized performance brings to mind always that this is fiction, albeit with a message that bears on reality. Returning to the comparison between Attack of the Clones and *Corpus Callosum, I would also argue that both films are born to differing degrees from avant-garde traditions, given Lucas’s directorial background and origins (his early work in short films is largely comprised of formalist experimentation, and even his feature debut THX 1138  eschews many of the customary characteristics of its genre). What defines Attack of the Clones more than anything is its wild formal inventiveness, which remains unprecedented in mainstream cinema. And like Snow’s Callosum, Lucas’s film deals with the futuristic possibilities of digital filmmaking, in this case, resulting ultimately in the alteration of an entire art form. Many of the film’s most striking sequences are its most loudly digital; take, for example, the aforementioned droid factory sequence, or Obi-Wan Kenobi’s impromptu tour through the clone “plant” on Kamino. As with the majority of special effects scenes in the prequels, this series of shots incorporates digital modifications and characters into physical miniatures and sets. Here, the “digital” pushes through more distinctly than the “physical,” the digital signified by deep-focus shots of clone pods and training centers, and by the wispy, utterly alien figure of Kaminoan Taun We. Also worth noting is the remodelling of Yoda, from the puppet in The Empire Strikes Back (1980) to a newly expressive, mobile, and digitally animated version. Mainstream film’s transition into digital production and projection gained a great deal of momentum after the release of Clones, and by now the ubiquitous change is undeniable. Lucas had cameras developed specifically for the second entry in his prequel trilogy, which allowed him to forgo the cumbersome process of merging digital and celluloid technologies. 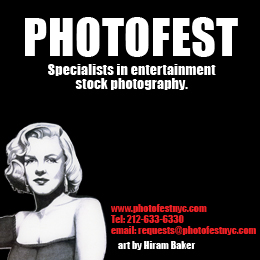 The digital cameras sharpen the image, but also render it strange and uncannily unfamiliar. If the origins of cinema can be viewed as “avant-garde” gestures, then it makes sense to compare Lucas’s most contemporary work to the earliest of cinematic experiments. Forget contemporaries; why not consider the ways in which Clones echoes the technical excitement of Sallie Gardner at a Gallop (1878) or L’arrivée d’un train en gare de La Ciotat (1896)? Like these early discoveries of the moving image, Attack of the Clones uses advances in technology as impetus for seeking out original artistic possibilities. In Lucas’s case, the formal advances allow him to create complex environments, and to pose bizarre correspondences between human actors and fabricated spaces. 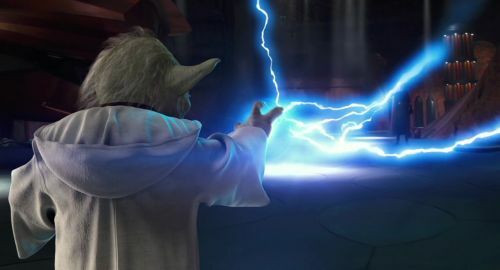 Take, for example, a futuristic “conference call” in the Jedi temple – live actor Samuel L. Jackson sits across from the animated Yoda, both characters interacting with the hologram version of live actor Ewan McGregor. Bridging the gap between Michael Snow and these nineteenth-century cinematic ancestors, I also see in Lucas’s work the ghosts of Lillian Schwartz and John Whitney Sr.; ingenious innovators of avant-garde cinema, Schwartz and Whitney crafted some of the earliest experiments in computer animation, both artists painting the screen with gorgeously strange tones and patterns. Schwartz displays some of her most inventive imagery in Pixillation (1970), Olympiad (1971), and Apotheosis (1972) (among others), while Whitney demonstrates breakthroughs in works like Permutations (1968), Matrix I (1971), and Arabesque (1976). For both Schwartz and Whitney, the sheer concept and possibility of computer-generated art was art in itself. For Lucas too, this holds true: this is nowhere clearer than in Clones’ opening shots, which trace the movement of animated starships gliding above the glittering dome of Coruscant and then plunging through its digitally painted cloud coverage. As a series of moving images, this introduction comprises some of the most aesthetically balanced and carefully contrasted work in Lucas’s filmography, and it relies entirely on the artistry inherent to digital technology. As I point out in my review of Revenge of the Sith (2005), all six Star Wars films employ a philosophy and aesthetic of pure anachronism. This plays out most clearly through the formal elements I’ve described: the exploration of new technologies evokes the advent of cinema itself, but the advanced nature and product of that technology is founded on futurism. In Clones, Lucas pulls from a wide range of cinematic moments to blur the boundaries between milieus and aesthetics – for example, Obi-Wan Kenobi’s irresolvable quest for the truth behind a developing clone army recalls the infamously labyrinthine plotting of Howard Hawks’s The Big Sleep (1946), and Lucas playfully invokes his own American Graffiti (1973) through vehicles (Anakin’s Coruscant speeder calls back Graffiti’s “piss-yellow Coupe”) and locations (Dex’s Diner brings to mind Mel’s Drive-In, also from Graffiti). The yellow speeder self-reference speaks to Lucas’s career-long obsession with vehicles (particularly their complex interior designs and their capacities for fast movement). This obsession is nowhere clearer than in the film’s early chase scene: as Anakin and Obi-Wan pursue bounty hunter Zam Wessell through the Metropolis-like nightscape of Coruscant, Lucas focuses constantly on the speedy motion of vehicles from one side of the frame to the other, to the rising and falling noise of engines, and the glinting of night-lights off the machines’ metal bodies. As for the use of Dex’s Diner, the location draws from the cultural associations typified by Mel’s Drive-In (a nostalgic sense of the American past, a place of momentary reprieve, an oasis of self-discovery and actualization). These cinematic references are not simply there for the passing amusement of cinephiles, but actually substantiate the film’s very purpose and meaning. Specifically, its associative imagery and iconography root our awareness in a world both familiar and strange. Also worth mentioning is that the study of morality and political corruption in Attack of the Clones brings much to bear on reality; the film ushers to the fore a complex element of human psychology. Before becoming a cipher of evil whose traits are inscribed in his very name, Darth Vader (“Dark Father”) is a human being (Anakin Skywalker) whose process of destruction is characterized by moments of choice. This naming of morality also plays out in the duplicitous nature of Senator Palpatine, whose evil counterpart (Darth [In]Sidious) represents all that is cruel. In observing this trope of the Human transforming into the Character or the Moral Cipher, I recall the techniques used by Edmund Spenser and other early authors of romantic adventure – in The Faerie Queene, characters (e.g. Error, Furore) stand in as allegorical devices, but taken together, their interrelations convey Spenser’s ethical suggestions for his readers. Indeed, the Star Wars saga (and especially the prequel trilogy) acts as a morality play, as I’ve suggested above, and its genre-codified structure transmits very real and grounded observations of our world. Like Edmund Spenser’s Faerie Queene, Star Wars instructs us to be more like Luke Skywalker (the possibility of a positive self that Anakin could have been), and less like Darth Vader. For this reason, the Star Wars films largely falter in the face of interpretations that impose modernist or contemporary psychology. So too do they resist comparisons to titles like those mentioned above (Potter and Rings). I argue that this is not a fault of the films. Instead, it is a fault of modernist critiques that rely on customary gauges of character “development” and “motives” while refusing to view differently, to see anew. The very foundation of Lucas’s cinematic philosophy is newness – this comes through in his obsession with technological possibilities, and through his genuinely childlike pursuit of spectacle and wonder. His work is both pre- and post-cynical, operating within literary forms that predate cinema by several centuries while also looking toward a new kind of film whose form hasn’t even been realized yet. In interviews, Lucas refers frequently to his aspirations of “tone poetry” in Star Wars, and the term makes sense in so many of the episodes’ particular contexts. In Attack of the Clones, take as one example the extended finale, which begins with a gladiatorial battle in the Geonosis stadium. The scene initially relies heavily on sound design and encoded references (the creature effects of Ray Harryhausen, the sustained romantic tragedy of Richard Wagner, especially Parsifal); but the conflict opens up spatially and thematically in tandem (moral representations collide through Jedi, clones, and military droids, and the ludicrousness of military allegiance shows through in C-3PO’s rearranged head and body). The correspondences between image, noise, and music build toward a totally synthesized cinematic language: these moments boast Lucas at his most adventurous and energetic, committing to an audiovisual purity that sets aside the baggage of contemporary filmic navel-gazing. Indeed, a bulk of the film’s finale is wholly digital: specifically, when the battle breaks free of the stadium, Lucas pits an army of droids against an army of clones, and both animated troops charge through darkly coy simulations of World War II footage. This wildly anachronistic sequence, unrestricted by the physical possibilities of actors and stunt people, is a frenzy of scope and imagination. All this is to say, simply, that the Star Wars films have always been unique and strange, sometimes startlingly so. And I would argue that Attack of the Clones is the strangest of them all, due in no small part to the fact that it was made with the help of such completely new technology. What’s even more startling is that it works both as a counterpoint (or even companion piece) to a film like Michael Snow’s *Corpus Callosum, while also drawing from its deeply ancestral expressions in cinema and literature (for me, Edmund Spenser remains the most intuitive point of reference here). In my above-mentioned review for Revenge of the Sith, I describe that film as Lucas’s greatest artistic achievement. In reality, I see all four of his Star Wars installments as parts of a single, totalized expression, carried through to slightly less brilliant effect in The Empire Strikes Back (Irvin Kershner, 1980) and Return of the Jedi (Richard Marquand, 1983). It’s difficult to think of another film of this scale with so much love for its medium, for the profoundly unique potential that it holds. Since its release, nearly fifteen years ago, nothing in cinema has changed everything quite so boldly. Mike Thorn is the author of the short story collection Darkest Hours. He completed his B.A. with honors at Mount Royal University and his M.A. in English Literature at the University of Calgary. His fiction has been published in a number of magazines and anthologies, including DarkFuse, Dark Moon Digest, and Straylight Literary Arts Magazine. His film criticism has appeared recently in MUBI Notebook, The Seventh Row, and The Film Stage. He co-authors the horror-themed series “Devious Dialogues” with A. M. Stanley for Vague Visages. Visit his website mikethornwrites.com or follow him on Twitter @MikeThornWrites.